Seemed like over a year had passed since I last baked Prototype 3. Since then I got a roughly 9 1/2" size Frieling springform pan, which would finally get its multiple-cheesecake-flavor-layer debut with the latest prototype here—after many single-layered uses. But would this pan be tall enough for this double-layered attempt? I trusted that it would. 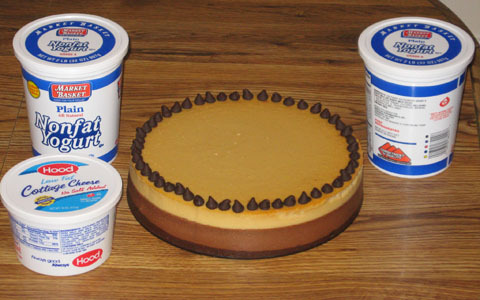 Other new developments coming into Prototype 4 would include yogurt cheese and other changes associated with it (see the baked plain cheesecakes for more info). Prepare ahead of time 32 ounces of yogurt cheese, derived from two 32-ounce containers (that's 64 ounces altogether) of nonfat yogurt. If the resulting yogurt cheese falls below 32 ounces, add back enough of the whey (that was strained out from the yogurt) to make up the difference. To this yogurt cheese combine one 16-ounce container of whipped, lowfat cottage cheese. Place resulting mixture in 9 1/2" (or 9") pan. Pour on top of crust. Wrap pan in foil and place in tub. Bake all this at 325 degrees for about 40 minutes. Carefully scoop this on top of the chocolate batter and return to oven, this time at only 300 degrees. Bake for about 60 more minutes. Turn oven off, leaving cheesecake in it (still in tub as well), with the door slightly ajar, for another 50 minutes. Remove cheesecake from oven and tub and let cool in its pan at room temperature for another 100 minutes. 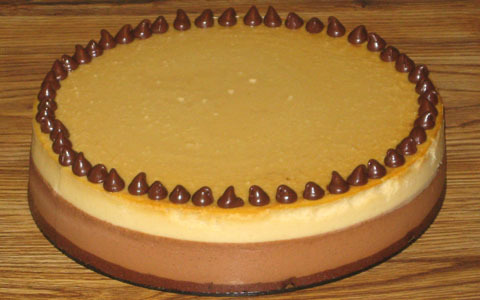 As an option, immediately after removal from oven, decorate this cheesecake with chocolate chips (or peanut butter cup candies such as miniature size cups or broken pieces of larger cups) around its edge. Afterwards, remove cheesecake from pan and refrigerate. The 9 1/2" Frieling worked out nicely in regard to having enough capacity for the two layers (and, of course, the crust). My memory made a minor mistake along the way. When I began baking the chocolate batter, I had the oven's temperature set at 350 degrees. It wasn't until about 10 minutes into the baking that I realized that this setting was incorrect. So to compensate for this 25-degree error, I quickly dropped the temperature down to 300 for the next 10 minutes. After that, I raised the temperature to a rightful 325 degrees for the remaining 20 minutes of the chocolate layer phase (fortunately, I remembered to resume baking at 300 after adding the peanut butter batter on top). I brought this cheesecake to the homes of two of my cousins, Joanne and Lauren, on Rosh HaShanah 5773, and I got a number of happy compliments. In particular, when I was at Joanne's, a number of cousins there not only expressed a great appreciation for my latest work, but they particularly liked this one better than the chocolate-only cheesecake that I served a few weeks back during a cousins reunion at my brother Eric's place in Tahoe (see Baked Chocolate Cheesecake—Prototype 14, for more details). This was somewhat expected, because I myself thought that the one in Tahoe was somewhat too tart. Only yogurt cheese was used for that one—no cottage cheese at all. But I also felt that the California yogurt used there did not strain well either. At least one guest at Joanne's suggested altitude as a factor (the elevation at Tahoe being somewhere around 6000 feet). As for my more recent, made-in-Massachusetts, chocolate peanut butter combo presented here, I felt that the taste certainly was not too tart. The flavor, in my opinion, was decent, with a hopeful balance of chocolate, peanut butter and "cheese". The tartness seemed to be just about right. Maybe the Market Basket brand simply worked better. Could it be the cultures? Cultured Pasteurized Grade A Nonfat Milk and Nonfat Milk Solids. Contains Active Yogurt Cultures including L. Bulgaricus, S. Thermophilus, Bifidus, L. Acidophilus and L. Casei. Market Basket (aka "DeMoulas"): The store where you always get "More for Your Dollar" (and more for your cheesecake! )—I, and many of my cousins, really like this supermarket. Sorry, no formal web site for this store. Looks like it wants to keep things simple (and that reduces the costs). No loyalty card to drag around (hooray! ), and (aside from grand opening celebrations) one edition of its weekly sale flyer for the whole chain (what is advertised on sale at a given price at one store is on sale at the same price at all the other 65+ locations—none of this narrow-segmented, prices-effective-only-in-such-and-such-city annoyance). But if you are starving for Market Basket on the Internet, may I suggest a great fan site? MyDemoulas.com (aka MyDemoulas.net)—check it out! I would estimate that more than 50% of the ingredients, at least by weight, of what I have been using altogether in my cheesecakes (and in my entire recipe scrapbook) are purchased from Market Basket. I also like Trader Joe's, another major ingredient contributor to my cheesecakes. This store is very big on natural and organic foods at decent prices, leading me to consider it the "Market Basket of natural food stores", at least with respect to pricing. I froze what was left of this latest chocolate peanut butter cheesecake (about a quarter of it) not long after Rosh HaShanah. Probably close to one and a half weeks passed afterward, before I thawed it out and brought it to a darts event where Steve and Lesa were playing. Steve enthusiastically raved about this prototype. When I pointed out the border of chocolate chips, he was impressed that I was getting "fancy schmancy" (his words) with my creation. Lesa enjoyed my cheesecake as well. She also told me that her cats had somehow snatched some of the leftover eggnog cheesecake that I made for her a number of weeks back (see Baked Eggnog Cheesecake—Prototype 16 for more info). Inasmuch as I was informed by her about lactose in dairy products not quite being feline-friendly, it was interesting to know that the results of my cheesecake efforts had somehow become "the cat's meow".